We've got a lot to cover this week, so let's get right to it. 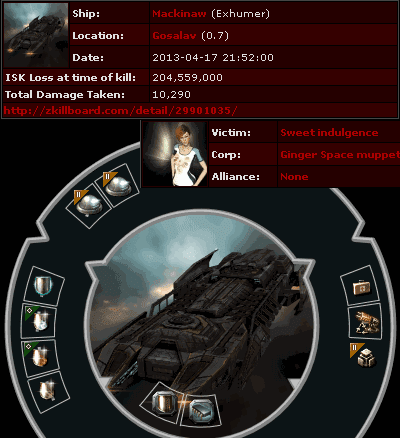 This week's (April 14th @ 00:00 EVEtime to April 20th @ 23:59 EVEtime) Kills of the Week! 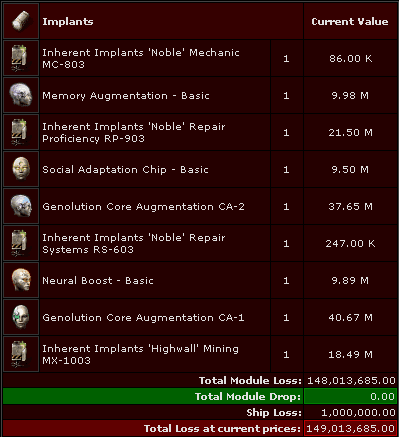 We begin with Lord Vent's 744 million isk Mackinaw. The bulk of the value comes from the two ORE Strip Miners. As long as Vent was going for a high-yield fit, he might have considered a tech II mining laser upgrade, but no. He seemed mostly concerned with increasing the cargo of his ship, despite CCP handing Mackinaws a built-in ore bay. Tank modules? "No thanks, no one dies in highsec." Agents Ziaeon, Lady Geesica Marstolt, and PinkOboe beg to differ! 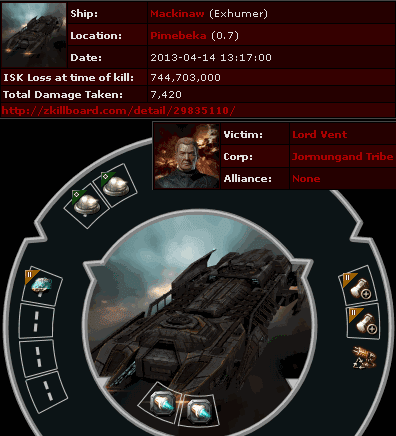 As if last week's wasn't bad enough, we bear witness to another mining battleship. WashingtonChoi's monstrocity was executed by Agents Ziaeon, Capt Starfox, Pestario Vargas, Nu'adu, and Dante Lobos. Thank goodness. Sweet indulgence indulged her desire to put together a medley of named, faction, tech II and tech I tank mods. 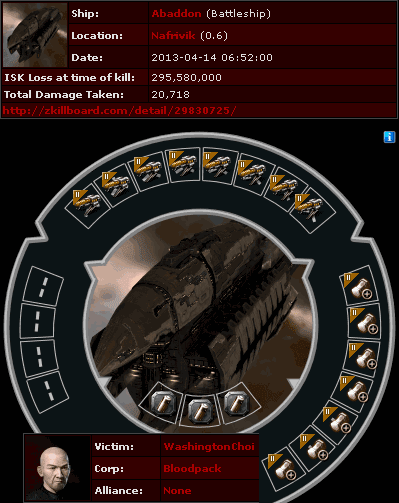 All were useless against Agents Galaxy Chicken and Galaxy Pig, who were happy to kill what is perhaps our first structure-tanked Mackinaw: Yes, those are tech II bulkheads along with the tech I damage control. 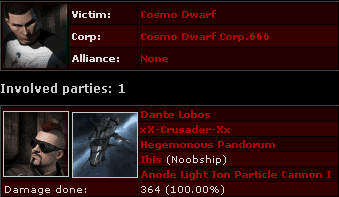 Even an Ibis can be a powerful ship, when imbued with the strength of the New Order and its righteous Code. I know what you're all really here for. You want to see a bunch of suicide ganked Orcas. 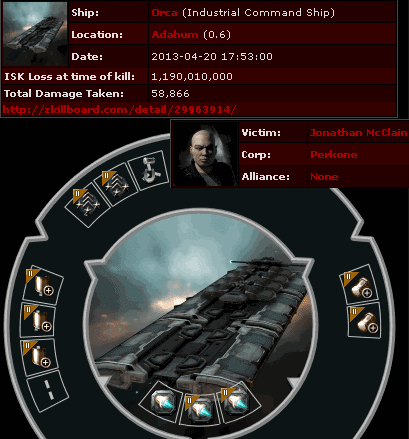 Jonathan McClain lost over a billion isk for want of a mining permit whilst flying this beast. Agents Ziaeon, Aefolatt Amos Itoga, Karbox Delacroix, Dante Lobos, Lady Geesica Marstolt, Lenda Shinhwa, and Miramune collaborated to take it down. But there were many other suicide gankings of Orcas during the week. Earlier, Jos Amaarr lost his Orca to Agents Capt Starfox, Ziaeon, PinkOboe, Karbox Delacroix, Dante Lobos, Garrison Woods, and Guybertini. Fatty Girl's Orca was put of its misery by Agents Capt Starfox, Ziaeon, Karbox Delacroix, Aefolatt Amos Itoga, randop, Lady Geesica Marstolt, Lenda Shinhwa, Dante Lobos, Viktor Eisenstien, and Miramune. Getting tired yet? Kurik Storm lost an Orca to Agents Capt Starfox, Ziaeon, Dante Lobos, randop, Guybertini, Galaxy Pig, Galaxy Chicken, Viktor Eisenstien, Aefolatt Amos Itoga, Karbox Delacroix, Miramune, and Lady Geesica Marstolt. Yes, one more: ted Ghasha lost an Orca to Agents Ziaeon, Guybertini, Lady Geesica Marstolt, Karbox Delacroix, Dante Lobos, Aefolatt Amos Itoga, Capt Starfox, and Viktor Eisenstien. Capt Starfox > VICTORY FOR THE NEW ORDER! Silitia Dais > What happened? Silitia Dais > oh they are decced? ChOoNoS > Just goes to show. In this game, nowhere is safe. For the rebel miners of highsec, indeed, nowhere is safe. ANOTHER GLORIOUS VICTXORY FOR THE NEW ORDER!!! I would just like to thank: Ziaeon, Capt Starfox, Pestario Vargas, Nu'adu, and Dante Lobos for putting that abhorrent abaddon on the fast track to the scrap heap. If i was an amarr slave i cant think of a worse fate than being forced to mine while my master was afk. Whatchu know about hull-tanked Mack? Nothin', that's what. Nowhere in Hi Sec is safe for a ganker. some random Hi Sec bot that bots in eve because i am a pro bot.